Native to Africa, freesias (Freesia) make cheery, fragrant houseplants, welcome additions to cut floral displays or lovely perennial bed plants. Freesias are bulb plants, and grow from corms, to be more exact. These small bulbs are fragile and require special care to thrive, but the prolific, scented blooms are worth the extra effort. Freesias can be hard to find in Northern gardens. Check reputable nurseries in the spring or order them online. Freesia corms are commonly sold in the fall in the south. Freesias are hardy in U.S. Department of Agriculture plant hardiness zones 9 through 11 only. In these warm areas, gardeners plant freesia corms outdoors in the fall. To thrive, freesias need well-draining soil. They’ll rot in soggy conditions. Amend heavy soils with compost, moistened peat moss, manure or other organic material. Another option is to grow freesia in raised beds. Plant freesias 2 inches deep with the pointed ends facing up. They should be spaced about 3 inches apart. Firm the soil lightly around them and water them well after planting. Water freesias at least weekly during the growing season in the absence of rainfall. Freesias will bloom for several weeks. During this time, you can cut some of the blooms for indoor use if you like. Once freesias stop blooming, the foliage will slowly wither and die. Don’t cut it back fall when it is completely wilted and yellowed. If you live north of zone 9, you’ll need to alter your strategy slightly. Northern gardeners must plant freesia outdoors in the spring, after the last expected frost. 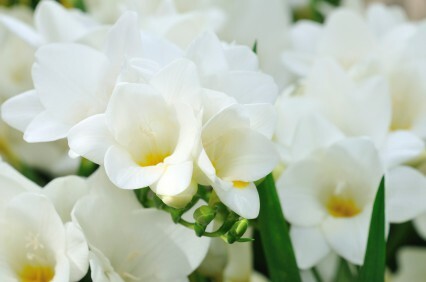 Give freesia well-draining, rich soil and plant in full sun. Water them as needed to keep the soil evenly moist, but never soggy. Come fall, you’ll dig up the freesias as soon as the first light frost kills the leaves. Dig up freesia carefully with a digging fork or even your hands. Be very careful not to nick the corms, which can introduce disease and rot. Gently remove the dirt and debris from the corms. Discard any that seem diseased and place the remaining corms in a tray. Store them in a warm, dry location for up to three weeks to cure. Once the corms have dried, remove any cormlets, or side sprouts. Store the corms in a labeled brown bag in a dark, dry place. Don’t store them in a shed, where rodents are likely to feast on them. Once spring arrives, inspect the corms and discard any that are moldy. Tuck the rest in the ground and start the whole process again! If all this sounds like too much work, freesias make excellent houseplants. Freesias are generally grown as a winter houseplant; planted in late fall through winter, they bloom from late winter to spring, and enter a period of dormancy during the hot summer months. To grow them as houseplants, plant 5 to 6 corms 1 inch deep in a 12-inch pot filled with light potting mix. Place the freesias in a bright, sunny room. Daytime temperatures should range between 60 and 70 degrees, with slightly cooler nighttime temperatures. Keep the soil moist, but not soggy. Freesias will begin blooming 10 to 12 weeks after planting. Some freesias can grow 18 inches tall or more, and require staking. After the blooms fade, allow the foliage to die back. Most people dig up the corms, cure them and place them in storage, but you could also try storing them in their pots in a cool, dark, dry location. Freesias have few insect and disease problems. In fact, their two major enemies are dampness and cold. Keep them warm and reasonably dry and they’ll usually stay healthy. To learn more about freesias, visit the Missouri Botanical Garden. Read Storing Tender Bulbs and Bulblike Structures from the University of Minnesota. This YouTube video shows you how to plant freesia corms / bulbs.